Textile fibers obtained from the fleece of sheep. The term wool is also used for a small amount of hair that is obtained from camels, alpacas, Angora rabbits (angora), Angora goats (mohair), Kashmir goats (cashmere), llamas, and vicuñas. Wool, or hair, fibers are composed of keratin. Wool has been used by man since Neolithic times. The Phoenicians exported wool as early as the 7th century BCE. Sheep were brought to England in the 6th c. BCE and Britain has been the established leader in world wool trade since at least the 14th century CE. Wool fibers have a hollow core, or medulla, surrounded by a shaft called the cortex. The cortex is covered with a layer of scale-like cells, called epithelial scales. The size and shape of the scales are characteristic of the source of the fiber. The scales are usually coated with a thin outer sheath called the epicuticle. 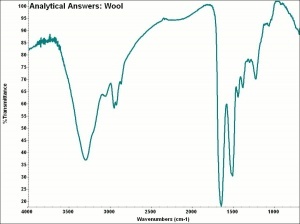 Wool fibers can range in color from white to brown to black. The fleece is obtained by shearing the sheep. Fiber length = 38-125 mm (fine), 65-150 mm (medium),125-375 mm (long). 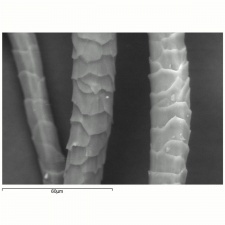 Fiber width = 17 micrometers( fine), 24-34 micrometers (medium); 40 micrometers (long). Elongation = 25-35% (dry), 25-50% (wet) Moisture regain = 16-18% Wool chars producing the smell of burning hair. It will not continue to burn when the flame is removed. Damaged by alkalis and most bleach solutions. Decomposes in boiling water. Susceptible to moth larvae and other protein-feeding insects. Encyclopedia Britannica, http://www.britannica.com Comment: "wool" Encyclopædia Britannica [Accessed November 7, 2001]. This page was last edited on 25 July 2016, at 14:29.